Local artist and author Nancy Martin-Rouse lived six miles outside the Southern Minnesota town of St. Peter when a series of mammoth tornadoes hit the town in March 1998. She and her husband, Jim, did what many others did: they got on a bus filled with doctors, lawyers, college kids and other people, and headed into town to help. They tried picking up, but it seemed to make little difference. Then Martin-Rouse witnessed something that changed the focus of her work. That writing led to the publication of “Storm of Spirit : A Child’s Story of Surviving and Sharing,” her first coloring book aimed at children who were struggling to overcome the aftermath of the tornadoes. Though she’d never written a book before, Martin-Rouse had been an artist all her life and worked as an art instructor for the Mankato, Minn. area Catholic schools. The book included an activity section at the end where children could express their feelings through artwork, and half the book’s proceeds went back to the community. “Other people were building houses and things, and I thought, this is something I can do for kids,” she says. “I think the reason it took off so well is because the whole idea of ‘Storm of Spirit,’ is that with people — after something bad happens — good people come to help, and we’ve seen that recently.” Many copies of the book also were donated to Jackson, Neb., residents after a devastating tornado blew through there this year. 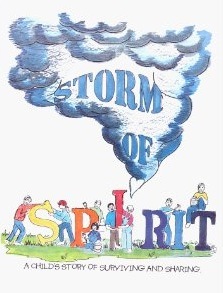 “Storm of Spirit” then served as a springboard for three other ‘helping’ color books that Martin-Rouse wrote and illustrated to encourage, entertain and educate children. Half of each book’s proceeds are donated to a related cause. 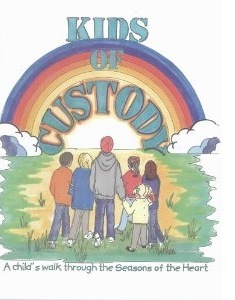 “Kids of Custody ” takes a child’s point-of-view through various stages of his parents’ divorce, and the proceeds started a scholarship fund for single parents and their children. 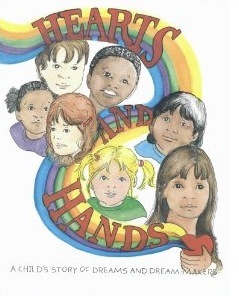 “Hearts and Hands” A childs story of Dream and Dream-makers ” introduces young readers to the realities of poverty and the possibilities to overcome it. The book also cites the history of Habitat for Humanity and tells the story of Millard and Linda Fuller, who founded the organization more than 20 years ago. Half those proceeds go to Habitat for Humanity. 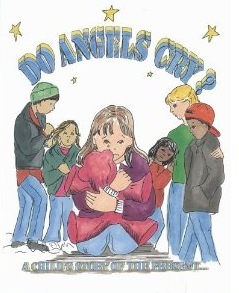 Martin-Rouse’s most recent book, “Do Angels Cry?” was written in cooperation with Mercy Medical Center, with half the proceeds benefiting the Mercy Child Advocacy Center. The book, which also includes an activity section at the end, addresses sensitive subjects such as abuse, domestic violence, neglect and families not having enough food or clothing. “Angels” give paths to the children leading to counselors, friends, teachers or a trusted adult. Martha Burchard, director of the Mercy Child Advocacy Center at Mercy, says using the book at the center has been both successful and positive. Burchard says the center has distributed the books to schoolchildren and given them out at educational inservices. Some children, receive them at the center, and they’re also distributed to the Department of Human Services to those who work with children and families. “When we give them to adults, it’s so that they will read and work with children in recognizing that children are frightened,” she says. “They know that there’s help for children who go through difficult situations.” With children, she says, the book helps them understand the process when difficult things happen and makes them realize they’re not alone. The book serves as a tool for group reading, where children often offer feedback for coming up with productive solutions. It could be a child who is lonely, or one who has had something difficult happen to them. The book is available for sale in all area Hy-Vee and Drug Town stores, as well as the Kaleidoscope Gift Shop at Mercy Medical Center. Martin-Rouse, who also teaches art instruction at the Sioux City Art Center, says she knows there will be some parents who have these problems in their homes who are not going to buy these coloring books for their children. For more information, e-mail Rainbow Ridge Kids or call 712-239-3357, or contact the Mercy Child Advocacy Center at 712-279-2548 or 800-582-0684.